Sideline Prep | Our Japanese Lovely’s Success Story! Our Japanese Lovely’s Success Story! Azusa Hashizume, who was member of Sideline Prep’s Pro Cheer Playbook Coaching Program, made the team of her dreams… the Washington Redskins Cheerleaders. Azusa made the final cut out of hundreds of contestants. Her journey was a bit more difficult and challenging than most… since she was preparing for the “Pros” all the way from Japan. Because of her strong dance background and love for performing, Azusa decided to try dancing on a professional level for the NFL. The first step she took was auditioning for a team in Japan. She auditioned… and made it on her first attempt. She danced for a Japanese American Football team called IBM BigBlue for 4 years. She didn’t just make the team, she became the Captain of the team. Her team won NFA Cheerleaders of the Year 2015 Central Division. As a next step, she made up her mind to seriously pursue her dream of becoming a professional cheerleader in the United States… with her eye on the First Ladies of Football… the Washington Redskins Cheerleaders. At that time she found Sideline Prep online, took a free training offered by Sideline Prep and then joined Sideline Prep’s Pro Cheer Playbook program. Even though she was in Japan, she actively participated in every single activity, conference all, check-in assignment, and group challenges that the Pro Cheer Playbook offered. Since she could not participate in person at all the events, she emailed dance and technique videos to get critiques and things to improve upon before auditions. 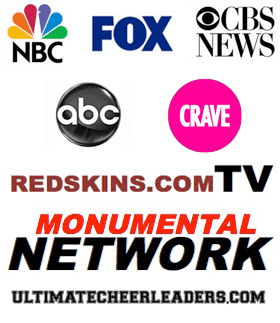 Azusa also attended the annual Pro Cheer Audition Prep Workshop in January 2016 where she met many current pro cheerleaders and had the opportunity to learn choreography from the coaches of the Washington Redskins Cheerleaders, Washington Wizard Girls, Baltimore Blast Cheerleaders, Richmond Raiders Cheerleaders, and the Lady Hawks Cheerleaders. She even got to meet the coaches of all the teams and ask them questions!! To ensure she could take as many Washington Redskins Cheerleaders prep classes as possible, she moved to Washington D.C a month before tryouts. These prep classes helped her practice, learn, and perfect the Redskins Cheerleaders’ dance style. Attending almost every prep classes also enabled here to show her dedication and commitment to the team and gave her the opportunity to meet and dance with cheerleaders on the team. This is something Azusa recommends to anyone who plans to audition for a pro team. After many years, months, weeks and days of practicing, working out, dancing, and crafting her look, she was chosen as a Washington Redskins Cheerleader out of hundreds of candidates. Her journey as a Redskins Cheerleader is just beginning. Congratulations & Good luck to Azusa! Top 10 Terrible Audition Mistakes You Don’t Want To Make! Will My Age Prevent Me From Making the Cut?